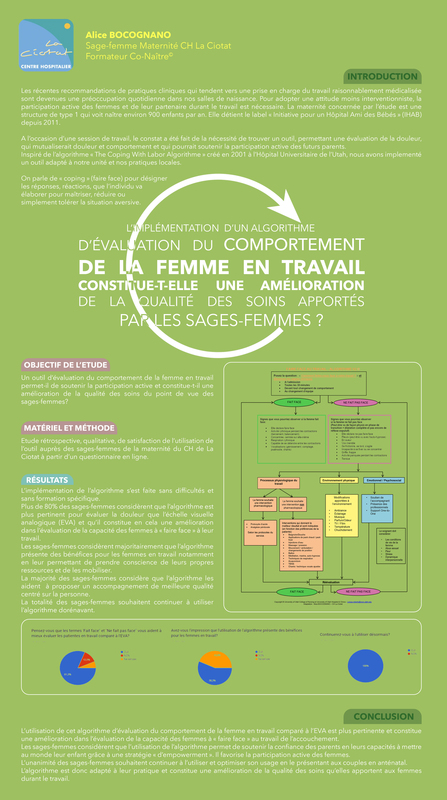 L’implémentation d’un algorithme d’évaluation du comportement de la femme en travail constitue-t-elle une amélioration de la qualité des soins apportés par les sages-femmes ? Review concludes that specific recommendations are needed to harmonise the provision of fresh mother’s milk to their preterm infants. UNICEF UK. Traduit de l'anglais par M. Landais et L. Girard depuis le document "Having meaningful conversations with mothers : A guide to using the BF signature sheets"
Early Use of Mother’s Own Raw Milk, Maternal Satisfaction, and Breastfeeding Continuation in Hospitalised Neonates: A Prospective Cohort Study. FCJ Fischer & al. Neonatology. 2017 Nov 30;113(2):131-139. Hunter S, Hofmeyr GJ, Kulier R. Cochrane Database of Systematic Reviews 2017, Issue 4. Art. No. : CD001063. Continuous versus pulsatile oxytocin administration for the augmentation of labour (Protocol). Frances J Kellie. Cochrane Database of Systematic Reviews 2017, Issue 8. Art. No. : CD011632. Implementation of Robert’s Coping with Labor Algorithm© in a large tertiary care facility. Fairchild E,, Roberts L, Zelman K, Michelli S, Hastings-Tolsma M. Midwifery. 2017 Jul;50:208-218.